Forty-six teams of middle and high school students from Southeastern North Carolina, Charlotte and Pembroke participated in the 2019 Regional Competition, hosted by WCE’s Center for Education in Science, Technology, Engineering and Mathematics. 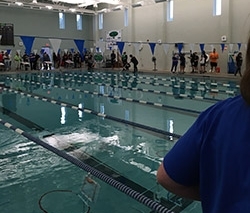 The competition took place at the Dinah E. Gore Aquatics Center on the campus of Brunswick Community College on January 19. 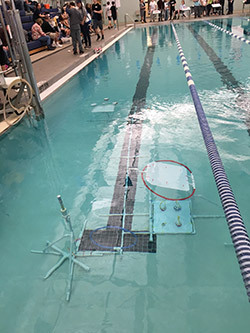 SeaPerch is an underwater robotics program sponsored by the United States Navy and RoboNation, an organization under the Association of Unmanned Vehicle Systems International (AUVSI). The program is designed to engage students in an authentic STEM design project to build, modify and operate an underwater Remotely Operated Vehicle (ROV). During the competition, student teams are challenged to complete tasks and navigate obstacles underwater. In 2018, the world watched rescuers use a team approach to safely navigate a cave in Thailand to save a group of trapped students. This year’s 2019 SeaPerch Challenge Mission: Rescue and Recovery was inspired by this real-life event. Teams were required to turn on a beacon, open a vault, move canisters to a platform and recover parts from a stranded ROV. CESTEM program associate Michelle Hafey coordinates the regional competition. This is the fifth year CESTEM has hosted the regional event and the third year UNC Charlotte’s Center for Science, Technology, Engineering and Mathematics (STEM) Education has participated with SeaPerch teams from the Charlotte region. SeaPerch is growing in North Carolina so CESTEM will travel to Charlotte in April to participate in UNC Charlotte’s regional competition directed by Alisa Wickliff, Associate Director, UNC-Charlotte STEM Education.